Let your imagination run wild when garnishing this fresh fruit smoothie with over-the-top treats! Place sprinkles on small plate; shake plate to create an even layer. Pour honey onto second plate; dip rim of 2-cup (500 mL) Mason jar into honey, tilting and swirling until rim is coated. Dip in sprinkles to coat. Set aside. In blender, combine orange juice and International Delight coffee whitener Reduced Sugar French Vanilla flavour. Add banana, mango and strawberries; blend until smooth. Pour into prepared Mason jar. Adhere cotton candy to one end of a skewer. 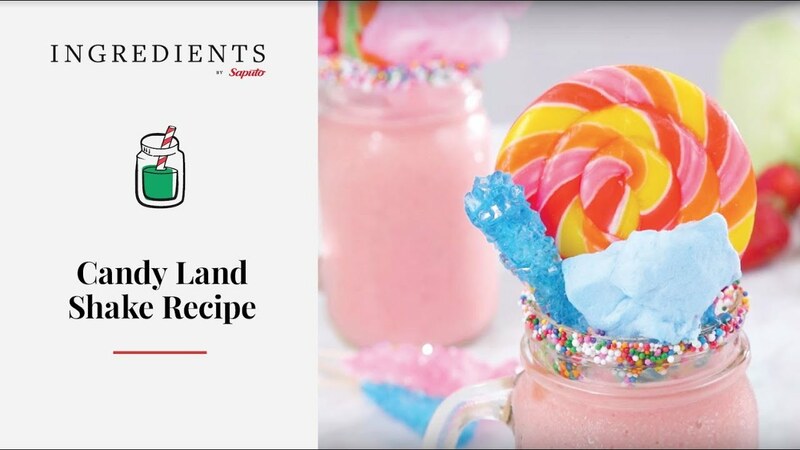 Garnish Mason jar with cotton candy skewer, rock candy, lollipop and bonbon. Serve immediately. - Try a variety of fruit combinations, such as blueberries, raspberries and pineapple. - Assorted colourful candy can be purchased at bulk food stores, party stores or specialty candy shops.